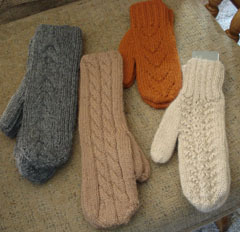 These are some of the Alpaca Products that we have available. 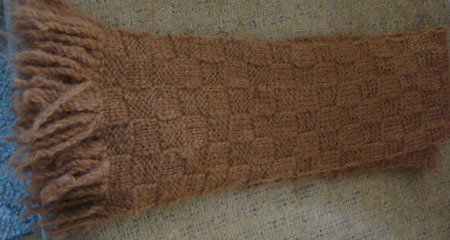 Socks that are truly a joy to wear and do keep the feet warm. 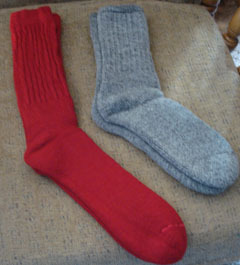 We wear them year round and have no issues over heating as they keep the feet at a natural temperature. 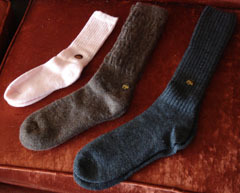 The socks come in a dress sock, a casual sock, a therapeudic sock, and heavier boot socks. There are blue, black, grey, brown, red, pink, denim and some heather in various sizes, S, M, L, XL. And kid's socks in pink and heather grey. 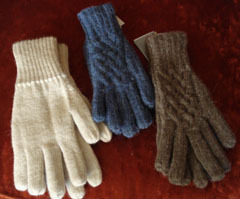 Gloves and mittens are available in various sizes and colors. 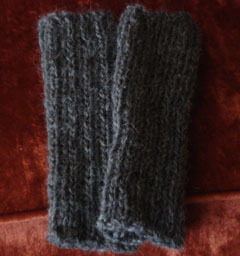 And then the fingerless gloves that all who drive or text can be grateful to have. These can even be used as arm warmers. Of Course, these come in all the colors we have available in our natural yarn (grey, white, black, multiple browns, beige, beige heather, as well as red, blue, green and purple blends. 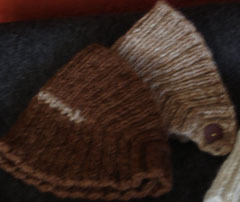 Our headbands will come in two flavors and the same colors as the fingerless gloves. 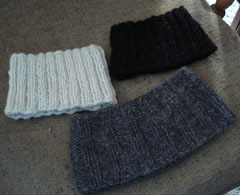 And the alpaca hat in white, and medium brown . 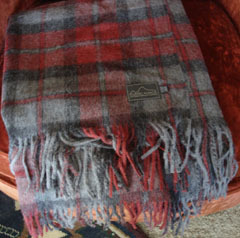 We also have full length scarves and mini-scarfs,, neck cowls, in all colors as well. These come in a basket weave with fringe, in seed patterns, and basic patterns for women, men as well as children's sizes. 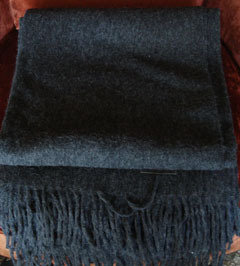 Additional Products Blankets that are 55% alpaca and 45% wool. 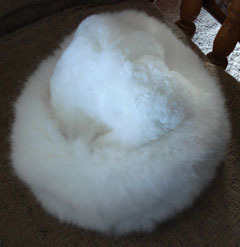 A great gift to have or just to have around your home to cuddle up with. We also have rugs and rug yarn available to weave your own rugs. These are great to step on when you stand at the kitchen sink for a long time or when you roll out of bed in the morning. I keep on at the bathroom sink as well.